I was deep in the heart of Beijing, People’s Republic of China, in the summer of 2009. For the first time in my career, I was the lead studio executive on a feature film—the remake of The Karate Kid, starring Jackie Chan and Jaden Smith, son of actor Will Smith. It’s important to understand that Beijing—the ancient capital of China—is huge. The urban area alone contains about 13 million residents; that’s four cities of Los Angeles. Beijing is also complex on a Byzantine scale, and with the producers, entire crew, and cast there, we had ventured far into some of the oldest parts of the city, into ancient neighborhoods called hutongs where the living style was more communal and we could find the character and feel we were looking for. Getting cast, crew, and equipment there was a major undertaking, the shots were taking a long, long time to set up and complete, and as I stood there, we were running out of daylight. Sunset is usually panic time for a film crew. Unless you’re shooting night scenes, you try to work in every last shot you can, using reflectors to capture every last bit of natural light. The crew was working as quickly as they could to maximize what was a very expensive day of production. But I had other concerns. I glanced at my watch, shot a look at the disappearing sun, and knew that even though I was the sole representative for Columbia Pictures on set, I had to leave. I had no choice. That is, I didn’t give myself a choice. Fortunately, the producers knew that I would be making my way back to the hotel. It wasn’t a surprise to anybody. I pulled one of the production assistants aside, told him I would be catching a taxi, left the production in the capable hands of the producers and director, and disappeared into the streets of Beijing. It was an act that might have been ridiculed if I hadn’t set a precedent years before and remained committed to it. Leaving set on the first movie you’re running—shooting halfway around the world—isn’t advisable if you want a long prosperous career in Hollywood. But I didn’t lose my job. In fact, my departure didn’t make a ripple in the day’s shoot. I was able to attend to something infinitely more important: keeping a promise to God that I made many years before. I was born thirty-two years ago and raised as a Seventh-day Adventist. Among other things, that means I celebrate the Sabbath. So from sunset on Friday to sunset on Saturday, I unplug from my hectic life as a Columbia film executive. No work. I don’t check e-mail or roll calls. I break the fourth commandment of the movie business—Thou shalt never turn off thy BlackBerry—and turn off my BlackBerry. The Sabbath is my time with the Lord, my time to unwind from the pressures of work, heal, and reflect on the many blessings in my life and the career path that has led me here. On Friday nights I study my Bible, pray, spend quiet hours in communion with God, and make plans with family for church and fellowship on Saturday. Unless I happen to be in Beijing. In that case, I’ll read Scripture, watch the incredible metropolis slowly come to life, and pray that the dailies look good. Normally I would go to church, but in China most of the Christian churches are underground and I had no idea how to go about finding them. So I settled for reading the Bible and spending time in private communion with God—my own personal church in the midst of one of the world’s busiest cities. The next morning, I decided that didn’t want to spend the entire Sabbath in my hotel room. I ended up going to a park right outside the Olympic Village where I could sit under God’s sky, watch the birds, listen to gospel music, and read the Word. As I was going through Romans, the idea came to me for this book. Just like that, clear as day. YOU MAY FIND IT impossible that a Hollywood studio executive is also a devout Christian. But it’s not a contradiction. In reality, my business is not very different from your own. There are opportunities, politics, unspoken expectations, and a set of rules for advancement that are very different from the Lord’s rules. No matter what line of work you find yourself in, you may feel that being a Christian is holding you back. You may feel caught between a rock and a hard place. On one hand, if you don’t toe the company line and put your career first, can you still call yourself a company man or woman? On the other, if you ignore the Word and set aside the precepts of your faith when it’s convenient, can you still call yourself a Christian? Sometimes, it feels like we’re walking on a tightrope and below us there’s no net, just a big, dark abyss. to become the person God wants you to be. I know writing this book is definitely part of my journey to become who God wants me to be. Some would probably say I’m crazy. The common practice when you’re in business is that you write a book after you’ve either reached your goal and accumulated some power and prominence or left your industry altogether. I’m in neither place. I’m just like most of the people reading this book: still climbing the corporate ladder and/or right in the middle of my career pursuit. Yet I believe God has called me right now to share my unique experiences and this urgent message with you, so I must be obedient to his will. The message? During my time in the film industry, I have put my faith front and center for everyone to see. It’s my experience that people handle the intersection of faith and career in one of two ways. Some conceal their beliefs at the workplace, dumping their Christian principles on the kitchen table like a spare set of keys when they leave the house in the morning. Others refuse the command to be “in the world but not of the world” and work only in environments run by and for other Christians. Both approaches are problematic. If we lock our faith in the closet from nine to five because we’re afraid of ridicule or questions about our loyalty, what governs our choices in climbing the career ladder? Will we lie, cheat others, or stab people in the back, then go home at the end of the day and put on our “I’m a Christian” clothes again? Plenty of people do exactly that because they fear that if they go public with their faith at work, they will be perceived as weak, divisive, or unwilling to do whatever it takes to succeed. But if we make such a choice, what does that say about our faith? On the other hand, as believers we sometimes shun the secular world and limit our job prospects to a select group of potential employers or industries that we believe will be Christian friendly. But by doing so, we can lock ourselves in an echo chamber of ideas and beliefs just like our own, so we never really stretch or grow. Sometimes, we come to regard the world outside our bubble as the enemy. When some Christians learn that I’ve worked in entertainment for over ten years, I can feel them take a mental step backward, as if they feel I’m sleeping with the enemy. I’m not offended; to many Christians, Hollywood is a modern-day Sodom and Gomorrah. This business is probably the last place most people expect to find a young Christian visibly and vocally expressing his faith while progressing in his career. But the truth is that not only has relying on my faith not harmed my career prospects, it has actually enhanced them. God’s will has priority over mine. Commit to the process of success that God has planned for me, no matter how long it takes. God has the authority to put my ambition in check. Strive to let the love of Christ be apparent in everything I do. Do not allow sin to reside in any area of my life. If I allow it, I understand it will limit my ability to receive God’s full blessings. Do everything in my power to bring God’s purpose for my life to fruition (faith without works is dead). Don’t take shortcuts; if I want to be true to my beliefs, then shortcuts do not exist. Remember on the down days to never give up on myself and the dreams God has given me. I can truly say there is nothing in this world worth giving up what I believe in. I’m amazed at the number of people of all faiths I’ve met who don’t understand that their faith is not an obstacle to fulfilling their dreams but the path to them. They don’t understand the power that a total commitment to God grants them. He was a Christian, but it never occurred to him that God had a place in his career pursuits. I know from many of my own experiences that if you put your career in God’s hands and trust him, you can’t account for all the ways he will bless you. But you have to take that leap of faith, and even if you consider yourself a believer, that can be the hardest part. God’s love is unconditional, but we need the faith to silence our own voice and listen to his. Then we can really hear what he’s been trying to tell us about our careers all along. I’ve written Produced by Faith to help you make that leap of faith. By sharing my story and my testimony of how my faith has actually been the greatest asset in my advancement, I hope to inspire you to take a new view of God’s role in your career. At the end of the day, you don’t have to choose between your faith and your work. Faith and works are two sides of the same coin. Life is like a Hollywood movie, filled with twists and turns, highs and lows, ups and downs, comedy and tragedy. And just like a feature film, God moves us through life from the Big Idea into Development, then into Production and Distribution. No one knows this better than DeVon Franklin, a successful Hollywood producer and a follower of Jesus Christ. In Produced by Faith, Franklin encourages people of faith to let God write their story and to build a thriving career without compromising their faith. 1. Have you ever experienced tension between your career and your faith—either inner tension, such as a clash in values, or outward discrimination from others, or both? If so, describe how you handled the situation. If not, why do you think that is? If you can, share some practical tips you've discovered for successfully integrating career and faith. 2. 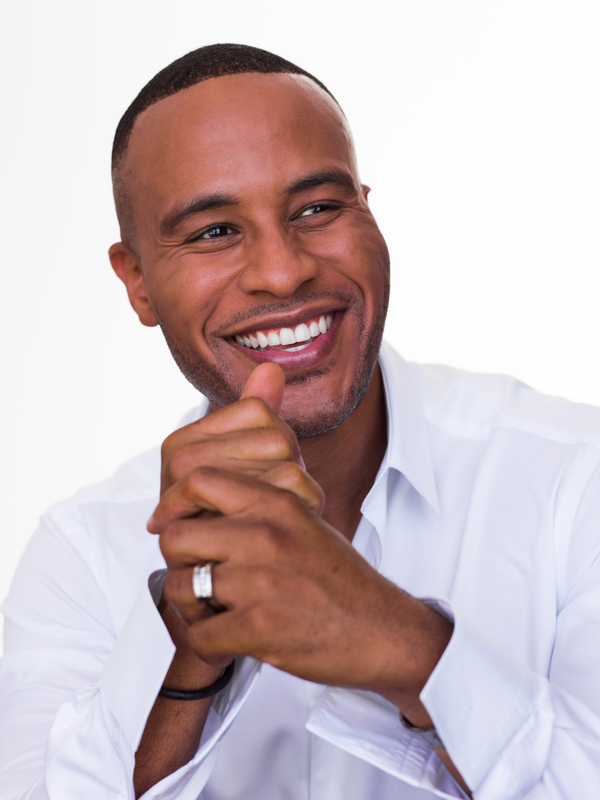 DeVon Franklin writes, “It’s my experience that people handle the intersection of faith and career in one of two ways. Some conceal their beliefs at the workplace, dumping their Christian principles on the kitchen table like a spare set of keys when they leave the house in the morning. Others refuse the command to be ‘in the world but not of the world’ and work only in environments run by and for other Christians” (p. 5). Have you found this to be true in your experience? Discuss the possible benefits and problems associated with each approach. 3. On pages 6–7, the author lists some guiding principles that he lives by. Do you, too, have a set of guiding life principles? If so, what are they? If you haven't ever written them down, try doing so now. 4. Do you think that your current job or life circumstance (as a student, a homemaker, etc.) supports those principles or competes with them? What could you do to bring your job and your life principles into closer alignment? 5. What stage do you think your life is in? Are you in Development? In Production? In Distribution? What are some signs that indicate which level you're at? Where would you like to be? What will it take to get there? 6. Discuss why God allows us to undergo struggles and setbacks. Can you think of a time that God used a setback to further your development? If so, describe it. Imagine how your career or your life might be different today if that setback had not happened. 7. Do you have a Big Idea of what you'd like to do with your career and your life? If so, share it with the group. If not, think about and discuss the questions found on pages 25–26 and 32 of the book. Be open to hearing what others in the group have observed about you—sometimes others can see qualities in us that we can't see in ourselves. 8. Do you think that Christians who rise to positions of prominence face special challenges? If so, what are they? Do you think that these challenges are good reasons for Christians to keep their aspirations modest? Discuss. 9. On page 147 the author says, “Jesus is a warrior and a fierce competitor. He's competing for the souls of an entire world and he's determined to win as many as possible. . . . There is nothing passive about being a Christian!” How does this description compare to your understanding of Jesus? 10. Is it possible that a person's Big Idea might not be God's intention for them, even if they really want it? How can someone determine whether to persevere and press forward, or to step back and pursue a different plan? 11. What does it mean to practice "quality control" on the job and in life (p. 166)? Is it more important to do things fast or to do them well? Why? 12. The author writes, "God has a plan to distribute your impact farther and wider than you may believe possible to the audience that needs it most" (p. 209). Discuss how God's distribution plan might work with your Big Idea. 13. Do you think you're good at accepting and responding to feedback? Why or why not? If not, how can you improve in this area? 14. Some Christians are wary of marketing and promotion, associating them with a hunger for fame and feeding one's ego. Discuss how marketing and promotion might work with God's purposes and not against them. 15. What does it mean to you to know that God is collaborating with you on your story? 1. 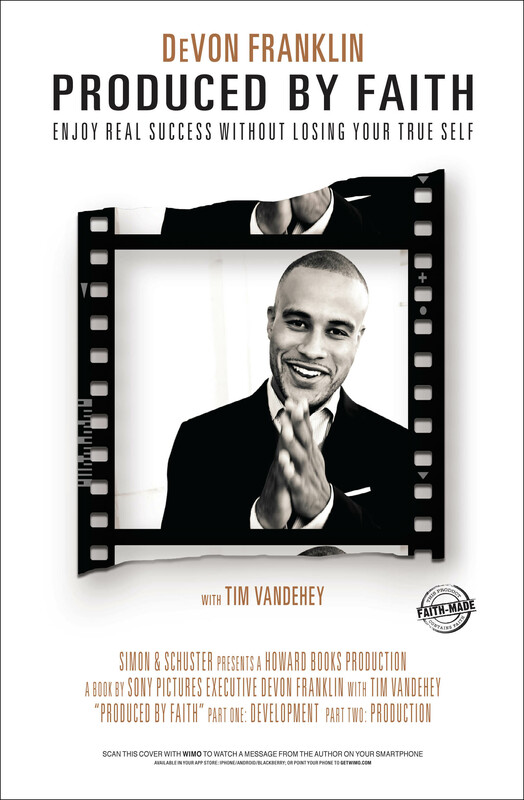 Watch a special video message from DeVon Franklin at www.producedbyfaith.com. 2. Enjoy a group movie night. Choose one of DeVon's movies mentioned in Produced by Faith (The Karate Kid, Jumping the Broom, etc.). Discuss the ways in which his Christian values are portrayed on the screen. 3. Consider making movie night a regular feature, maybe once a month or a few times a year. Read reviews in advance and be discerning in your choices. Afterward, discuss the values that were conveyed through the movie. Encourage one another to become discerning viewers instead of passive consumers. Support studios, producers, directors, etc., who promote values that align with yours.